Buffalo Bills to trade up in first round of NFL draft? Published: April 27, 2014 at 12:47 p.m. 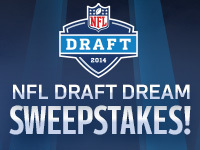 Updated: April 27, 2014 at 08:39 p.m.
Are the Buffalo Bills a candidate to move up the board in next month's draft? General manager Doug Whaley told WGR-AM in Buffalo on Friday that he hasn't ruled out a first-round trade for the right player, saying: "If we think this guy is going to get us over the hump and get us into the playoffs, which is our stated goal, then why not make the deal?" Bills director of player personnel Jim Monos also told the team's official website that Buffalo sees "five to six" prospects "that we would consider elite." The Bills, of course, pick ninth. While a flurry of surprise selections might bump one of those "elite" targets down, Monos said the front office is "open to everything" to get their guy. Buffalo's defense is packed with talent. We've talked about them on the "Around The League Podcast" as a squad that looks playoff-ready beyond the question mark at quarterback, where second-year passer EJ Manuel remains a work in progress. Whaley said last month that the team is "all in" on Manuel, but acknowledged this week that adding weapons around him is a motivating factor in considering a possible trade. "Sometimes you have to bring in a dimension that you don't have and a size receiver is a dimension that we don't have," Whaley said. "It would help EJ just because he can find that guy anywhere and also EJ can basically throw up the ball and you've got a 6-5 guy with 35-inch arms and 30-plus vertical, that's a big target that you can have down the field. So that's an exciting thing." That answer came specifically in reference to 6-foot-5, 231-pound pass-catcher Mike Evans out of Texas A&M, who NFL Media's Bucky Brooks called the "crown jewel" among this year's collection of "big, athletic receivers with the potential to dominate on the perimeter." Brooks named the Buccaneers, at No. 7, as his top target for Evans, with the Lions (No. 10), Giants (No. 12) and Rams (Nos. 2 and 13) in the mix. The way Whaley talked about the receiver, Evans to Buffalo -- perhaps the result of a little wheeling and dealing -- wouldn't surprise us from a Bills team potentially willing to move on from Stevie Johnson.